Most people forget that every room has a fifth wall – the ceiling. A wood ceiling is a beautiful way to add visual interest and warmth to any space. And the design effect is versatile: ranging from rustic to completely modern depending on the species and finish. 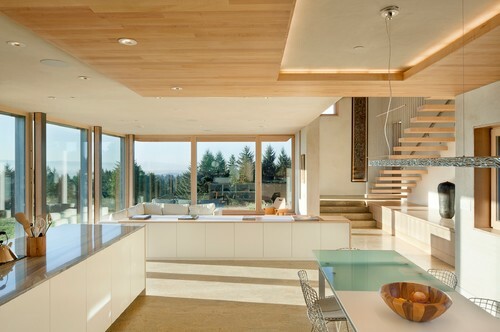 Wood ceilings are showing up in more and more beautiful and modern home designs. Here are just a few ways they can be incorporated into your modern Atlanta home. Drop ceilings, also called suspended ceilings, refer to ceiling panels that hang below the ceiling of the main structure. They are often used in spaces where ductwork, pipes, and cables need to be easily accessed. 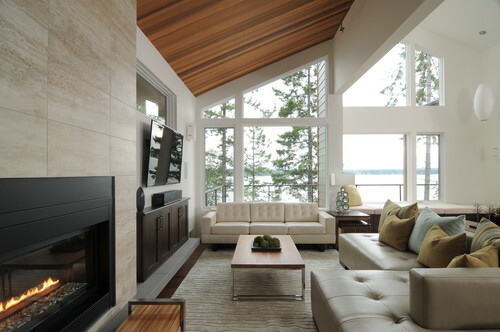 But pairing a floating wood ceiling panel in a main living space makes for a dramatic design statement as well. These suspended wood ceilings feature backlighting and recessed light fixtures that add depth and dimension. The floating wood ceilings in these kitchens help define the dining space within the open floor plans. Wood beams are a favorite of many homeowners. Keeping the beams close together, smoothed down, and in neat rows adds a modern look to this timeless design element. Alternating wood beams and exposed light bulbs draw the eye up and would offer an amazing glow during the evening. The modern wood beamed ceilings in this contemporary craftsman switch orientation from space to space. It such a large, open floor plan the orientation change creates a sense of movement and is fun deviation from predictable design. Raw wood ceilings and beams contrast nicely with the gray walls in this modern foyer. Black painted wood ceilings are a great way to add contrast to a room. Dark wood like this works best in spaces with particularly high ceilings. 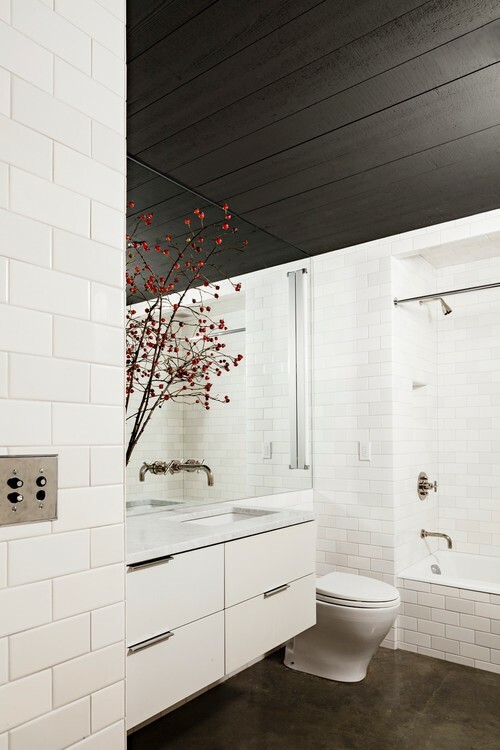 The black wood ceiling in this bathroom provides a needed touch of contrast and warmth to the otherwise white design. Painting the wood ceiling of this entryway black keeps the entire space feeling clean and minimalist. Black wood ceilings paired with older design and architectural elements creates an industrial look. Of course, a wood ceiling doesn’t necessarily need any dressing up in order to look beautiful. Raw or just simply stained wood ceilings can look right at home in even the most modern room. 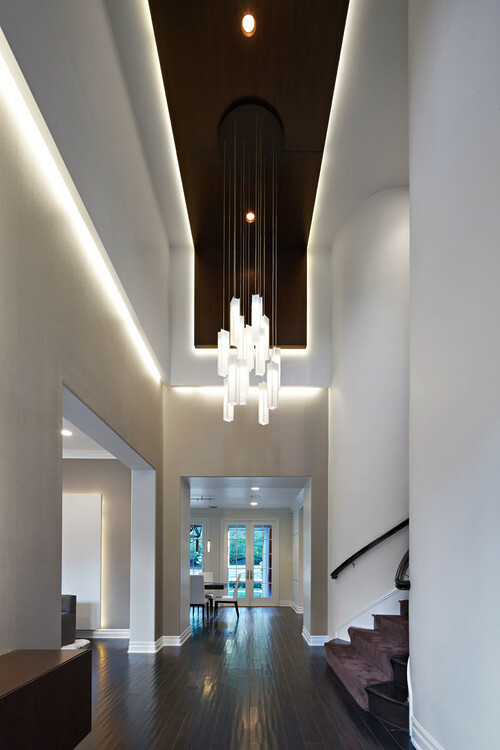 Raw wood ceilings are a soft, earthy contrast to the concrete ceilings in this contemporary entryway. At BoldForm Designs, we love working with Atlanta area homeowners. Visit our Houzz profile to see a portfolio of past projects. 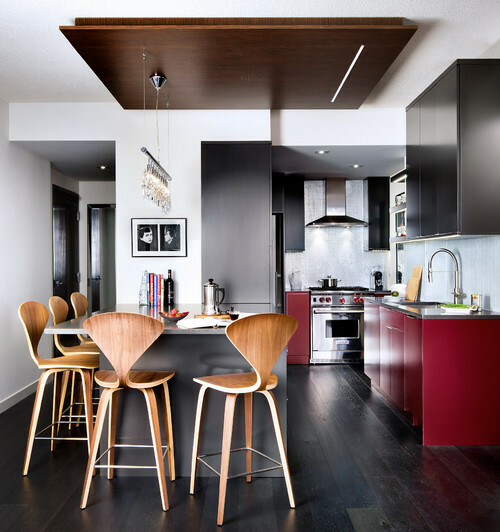 Interior Design black ceilings, black wood ceilings, contemporary atlanta design, floating wood ceiling, modern architecture, modern atlanta design, modern ceilings, modern interior designer atlanta, modern wood beamed ceiling, painted wood ceilings, suspended wood ceiling, wood ceiling. permalink.